I am so happy to be joining the Fat Quarter Shop Single Wedding Ring Blog Hop. Well, I hope you had a wonderful Valentine's Day weekend. 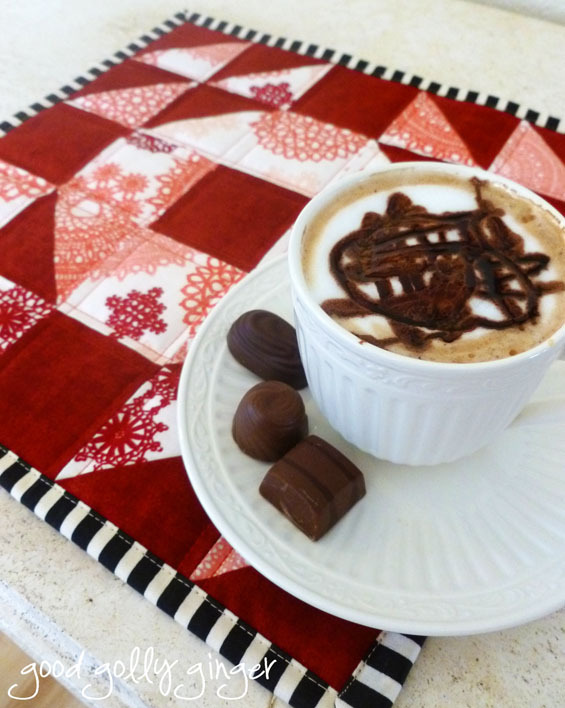 I certainly submerged myself in coffee, chocolate, and quilting. The Single Wedding Ring block is 13-inches unfinished. I decided to make two placemats for Valentine's Day. They look so good that I will keep them out for a few more weeks! I used Riley Blake's Lost and Found Love in Pink Main and Riley Blake Designs Basic Shades in Wagon Red. I also used Lost and Found Love in Black Stripes for a contrasting binding. I love those doilies in pinks and reds. This is a free block pattern by the Fat Quarter Shop, and you can download it here. This block is super simple and truly lovely. Kimberly at the Fat Quarter Shop even made a video for the Single Wedding Ring block which shows how to quickly make all those half square triangles. 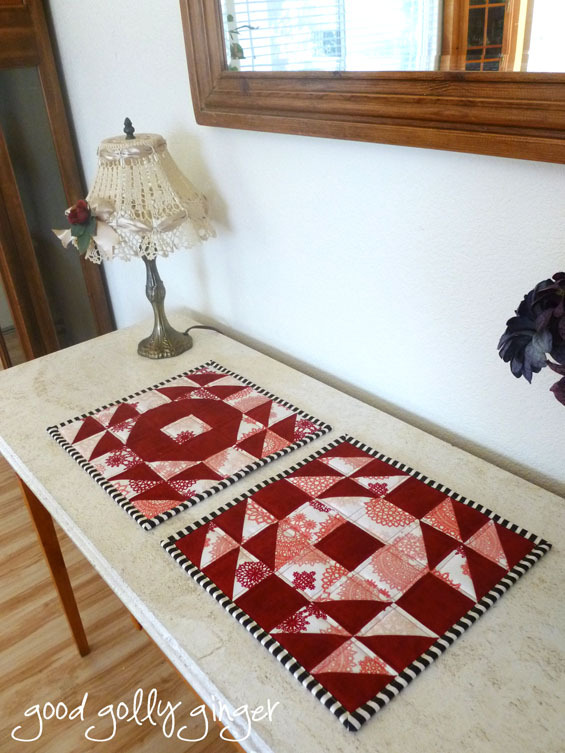 The block pattern is free, but if you would like to make a quilt from crib-size to king-size, then you can purchase the quilt pattern at http://www.fatquartershop.com/single-wedding-ring-pdf-quilt-pattern. There is also a lap-size quilt kit available for purchase at http://www.fatquartershop.com/single-wedding-ring-quilt-kit. The colors of this kit are absolutely exquisite and perfect for Spring. The first book is Winter Wonderland by Sherri Falls of This & That Pattern Company. This book has instructions for 12 cozy Christmas projects including 9 quilts, 2 table runners, and a tree skirt. If you pre-order today, you will receive an exclusive Mini Nordic noel Sampler pattern for free! The second book available for pre-order is Farm Girl Vintage by Lori Holt of Bee in my Bonnet. This book includes complete instructions for 45 sampler blocks in two sizes (6” and 12”), 10 quilts, 2 table runners, a table topper, and a potholder. If you pre-order, you will receive the Canning Season pattern! Thank you so much for visiting Good Golly Ginger on the Single Wedding Ring Blog Hop! LOVE your red and white blocks! Perfect for Valentine's Day! What a great color combination and just perfect for Valentine's day. The binding is a great finishing touch, too. 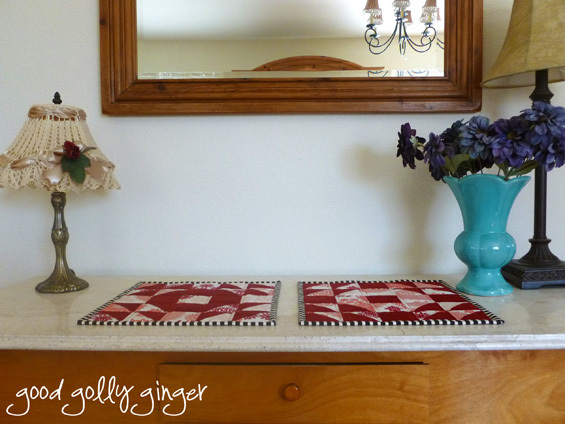 Great table mats! I love the binding with the red and white. Lovely! oh I love those! They really stand out with that binding! I like to use B&W bindings too. 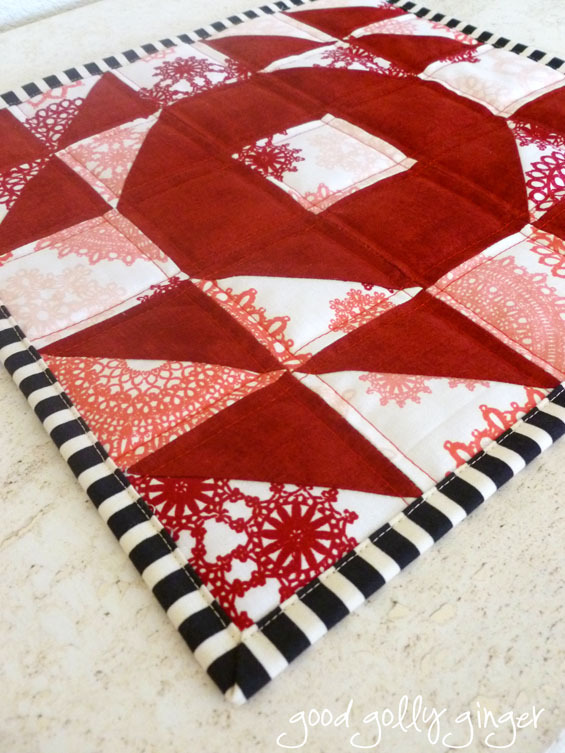 Nice to see another redhead quilter! Beautifully done! I love the binding!